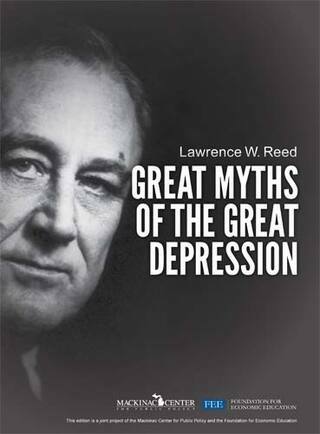 Students today are often given a skewed account of the Great Depression of 1929-1941 that condemns free-market capitalism as the cause of, and promotes government intervention as the solution to, the economic hardships of the era. In this essay based on a popular lecture, Mackinac Center for Public Policy President Lawrence W. Reed debunks the conventional view and traces the central role that poor government policy played in fostering this legendary catastrophe. Buddy, Can You Spare $40 Million? "The greatest spending administration in all of history"
Free Markets or Free Lunches? "Nothing to fear but fear itself"
"An astonishing rabble of impudent nobodies"
Postscript: Have We Learned Our Lessons?